Professor Ho Kyoon Chung, a chair professor of Sungkyunkwan University who previously held a position of head of Samsung Display research lab, developed products at the OLED display development forefront while in the industry. He is a world renowned OLED expert who is, at present, concentrating on flexible OLED lighting development at university. Professor Chung is developing flexible OLED lighting together with Korean material companies, lighting company, and Germany’s Fraunhofer Society. 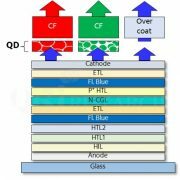 Chung is pursuing development of flexible OLED lighting that can produce white light via CCL (color change layer) made with fluorescence and QD materials on top of R2R evaporator produced blue emitting material on stainless steel substrate. Chung considered the automotive flexible OLED lighting application to be the most important factor in flexible OLED lighting’s success. Most of the companies that are currently developing OLED lighting use multi stack structure as they are aiming for high efficiency device to compete against LED. However, Chung pointed out the condition required for OLED lighting to enter the market is production cost rather than efficiency. 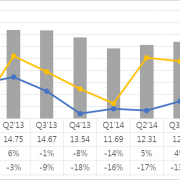 Chung emphasized that reducing the OLED lighting production cost is a priority and explained that many lighting companies that he has met wanted lower priced panels as OLED lighting is not used in everyday life even with high OLED lighting efficiency. Chung mentioned that in order to achieve this OLED structure needs to be simple more than anything. The OLED structure that Chung is developing is the simplest structure that uses only the blue layer. Therefore if the development is successful the production and investment cost can be massively reduced. What is Professor Chung’s flexible OLED lighting growth solution? The rear lamp and interior lights of automotive that current vehicle makers are pursuing use batteries, and does not require high efficacy products unlike other lightings. For these reasons, Chung explained that automotive lighting is the best market where OLED lighting with simple structure can be applied, and forecast the best product that can place the lighting following the curved design is flexible OLED lighting. On the other hand, Chung revealed that there are some difficulty in technology before flexible OLED lighting can be commercialized and form a market worth billions of USD. Blue emitting material was named as the most necessary part, an analysis that material’s color purity and efficiency are not quite enough for the blue material to produce white light. The second is encapsulation technology and materials. Chung indicated that the important aspect in attaching the gas barrier to the device is high moisture proof adhesive material and passivation technology. He also stated that speedy equipment is required. Professor Chung concluded that flexible OLED lighting is certain to represent Korean IT industry following display industry, affirming his passion to continue in his effort in making sure flexible OLED lighting grows into an axis of OLED industry. He did not forget to add an entreaty for the materials and equipment companies to press on in their development.